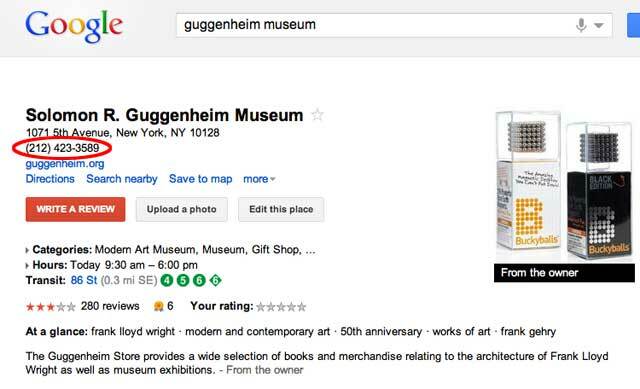 The famous and prestigious Guggenheim Museum in New York City is having problems with Google. Despite several weeks of trying to update their phone number in Google Maps, the phone number listed is still incorrect. The number Google should list is either the one given to them by the owner verified listing or the one listed on their contact us page? The Guggenheim posted a complaint about this over two weeks ago in the Google Places Help forum and a Google representative named Vanessa did respond a couple times but the issue is still there. As you can see, it's already been several months since our original request was submitted, far beyond the 4-6 period you specify. Multiple tickets were submitted to Google Places and auto-response e-mails were received indicating that action would be taken soon, however our listing has remained incorrect. We would really appreciate your help to expedite our request if at all possible.